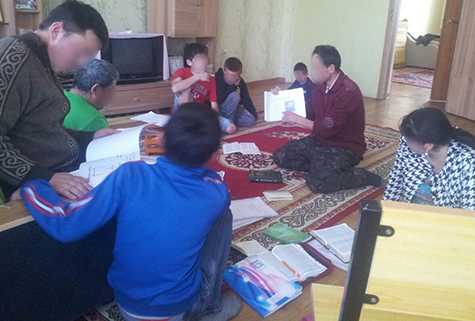 What follows is communications received at the LHF office from a Lutheran missionary working among the Kazakh people. Due to safety concerns, his identity and particulars about his location are being withheld. “The Kazakh people are over 99 percent Muslim, with only about two-tenths of one percent Christian representation. Overwhelming anti-Christian propaganda, religious persecution and harassment are regular obstacles to the proclamation of the Gospel in their midst. For the young Kazakh Lutheran Church, learning how to not only survive, but also stay engaged in their communities and share their faith with their friends and families are truly huge challenges that only the Holy Spirit can enable them to face faithfully. “The Kazakh church in this area is very young. In most villages and towns where we are working there was previously no ethnic Kazakh worshipping community of any denomination! “Because almost all the Kazakh Christians in our churches have come to faith and been baptized within the last 4-5 years, catechesis and basic Christian formation are fundamental. What a wonderful blessing to have Luther’s Small Catechism to use in the faith formation of this growing young church! Since the over 150 Kazakhs baptized in our churches in the country are spread over three provinces, it is impossible for me as the sole missionary to get enough face to face time with them all. The Kazakh catechism, published by the Lutheran Heritage Foundation, is key in facing this dilemma. “I spend time each week with the elders (themselves young in the faith), teaching them the catechism and providing them with teaching outlines that they then use when going out to the communities where our churches and home groups meet. We are slowly working on the Augsburg Confession, targeting especially the leaders in our church who could become the first future Kazakh Lutheran pastors! On the list of our immediate needs are both A Child’s Garden of Bible Stories (which we hope to complete this year) and God’s No and God’s Yes (a compendium of Walther’s Law and Gospel). “In Luther’s day, the Catholics of Europe were very religious indeed. But much of their faith was built not on the Word of God, but on the myths and superstitions that people had developed over the centuries. The goal of Luther’s Small and Large Catechisms, his various treatises, and the other Confessional books was to take a stand against man-made religion and to instead proclaim Jesus Christ crucified. “In a similar way, the people of Islam today follow myths devised by man—though mixed with Biblical stories like the creation and the lives of the Prophets. Though their religion contains some truth, especially in the area of moral laws, there is no room for the Gospel of our Lord Jesus Christ who alone can bring us all salvation. The books that we are publishing together with LHF are key in pointing people to Jesus and training up new Christians and solid leaders grounded in our Biblical Lutheran faith.